Great fresh food doesn’t need a lot of fuss to taste brilliant. This roasted chicken and potato dish is incredibly simple but will satisfy every tastebud. 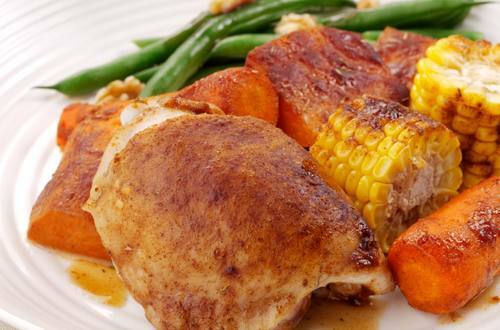 It’s probably the best roast chicken recipe for time crunched days and it’s healthy too! 2 Place marylands, sweet potato, corn and carrots into bag provided. 3 Add Recipe Base and close bag using included tie. Gently rotate bag to coat contents evenly. 4 Place on oven tray, in a single layer. Pierce top of bag 4-5 times with a skewer to vent. Cook on centre rack of oven for 40 minutes or until cooked through. 5 Remove from oven, rest in bag for 15 minutes before serving.